BarCode Read It! is a free Windows 8 QR code scanner App that can be utilized for scanning QR codes using a Webcam. Yes! using the cam attached to your Windows 8 Machine. Normally, this kind of task is performed using smartphones, but you cannot blame this app for doing so. In-fact this makes it interesting and fun to use. Not only QR codes, but it is also good at interpreting Bar codes as well. You can easily locate BarCode Read It! Windows 8 app under productivity (top free) section of Windows Store. On launching this QR code app for Windows 8 app for the first time you will receive a prompt about allowing it to access your webcam. For proceeding further, you will need to click on “Allow” button. Also, ensure that the webcam is attached/installed on your PC before launching the app. On doing so, the webcam will become active and the video feed will start appearing on the application window. Now, you need to focus webcam on any QR code or bar-code. Soon, the image will be analyzed & processed by the application and the obtained information will be presented to you. The best part is that BarCode Read It! 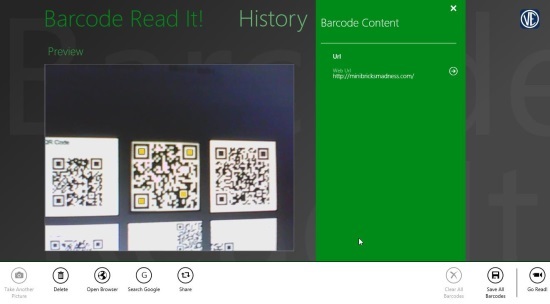 Windows 8 QR code scanner app also works in snapped mode. Upon detection the screenshot of the image and the interpreted information will be presented to you. Also, you can scan multiple QR codes in a go without any pause i.e. 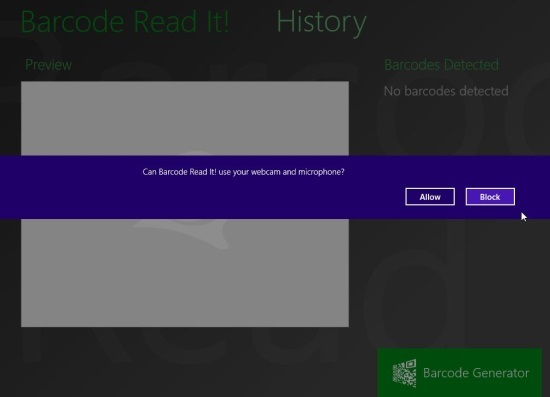 this windows 8 app keeps scanning/searching QR codes. 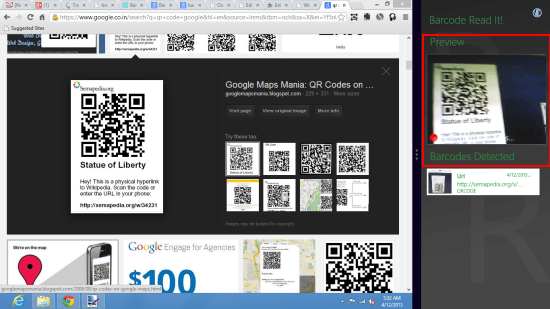 Finally, you can select particular QR image and then Right click to display horizontal bar at bottom. Now, select among the options to save, share, open in browser, and to search on Google. To continue with scanning some other code, click on “Go read!” button at rightmost corner. Just, open this link in any supported web browser. Then click on “View In Windows Store” button. Next, on the application overview window; click on “Install” button. BarCode Read It! is surely a cool tool to try. I am not much sure about usability, but impressed by its capabilities. I have no issues in recommending it. Also, note that the quality of QR code and the quality of your webcam are an important factor. Another, recommendation by my side will be try this QR Code designer app for Windows 8.